Are All These Chemicals Found in a Banana? 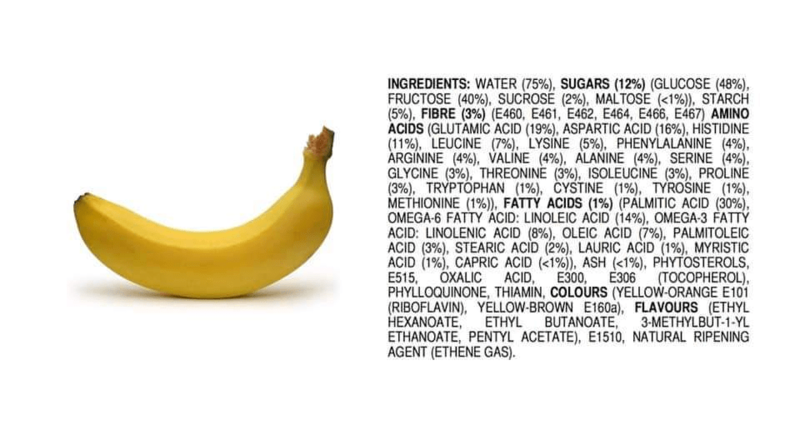 A list of chemicals, written as if they were ingredients on a food label, accurately depicts the chemical composition of a banana. This graphic is an accurate representation of the chemical constituents of your average banana, information that can be verified with the USDA Agricultural Research Database, which compiles studies into the nutritional and chemical content of various food items. This poster series breaks down all the major ingredients in popular natural foods — using E-numbers and IUPAC names instead of common names where they exist. Anthocynanins, for example, which are said to give blueberries their “superfood” status, are also known as E163. If these ingredients are considered hierarchically, the banana sounds much more simple. Like all fruit, it contains water, sugars, starch, fiber, amino acids, fatty acids, minerals (i.e., ash), and chemicals that impart their coloring. Myriad names can be ascribed to the various different chemicals that fit these groups, and Kennedy used a variety of different nomenclatural methods to make that point. The most common grouping of chemicals in the banana are sugars, and in this case the sugars are predominantly glucose and fructose, with lesser amounts of sucrose and maltose. After starch, a polysaccharide chemical found in abundance in plants, the next listed set of chemicals is fiber, another common group of carbohydrate chemicals. Phytosterols – a group of plant-derived compounds related to cholesterol. The remaining chemicals may sound intimidating, but they too are natural. 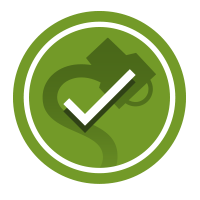 E1510 is another name for ethanol, which forms naturally as fruit ferments. The final “natural ripening agent,” ethylene gas, might sound downright nefarious but actually represents a neat intersection of plant and food science. In nature, the gas is a plant hormone associated with aging that triggers the ripening process. In the food industry, the gas is used on industrial scales to ripen a variety of fruits and vegetables all at once. In sum, this graphic accurately depicts the chemicals that comprise a banana, using a variety of tactics to make that completely natural food appear to be full of “chemicals” — something originally created by a high school chemistry teacher as part of a lesson on chemophobia. The New York Times. 21 January 2014. Angewandte Chemie. 24 May 2005. Livestrong. Accessed 21 December 2018. Journal of Experimental Botany. 30 June 2009.